“From Sagging to Success” is a message to urban youth and the adults who want to help them become extraordinary. Young people are unfairly judged because of their appearance and cultural misperceptions. They need to be made aware of the repercussions of sagging. Sagging pants even might be an indication of a sagging mindset or low self-esteem. A fictionalized character in book illustrations, Derrick goes from sagging to success as he learns about Black history, reads books read and written by successful people and changes the way he thinks. He shares his new knowledge with his parents who also embrace a positive outlook, productive behaviors and principles of success. At the end of the book, Derrick and his parents have successfully transmitted principles of success to the next generation. The book is beautifully illustrated and the paintings were created first as a library gallery exhibit. The book educates readers our history and successes, illuminates concepts of success and inspires them to act on what they learn. Readers are motivated to examine their thinking patterns, to recapture the dreams that they laid aside or never attempted and to accomplish them. They gain the wisdom and tools to become successful and are equipped to share those ideas, concepts and actions with others. Author Note: The book contains 15 paintings by illustrator Emery Franklin. The 14 of the illustrations are from his narrative art series, Crossroads: From Sagging to Success art series, that was on exhibit at the Benjamin L. Hooks Library during February 2011. Sagging is the fashion style of intentionally wearing your pants so that your underwear shows. This style is much older than the last 15-20 years. The trend can be traced back to urban teenagers of the 1970’s and the popularity of silk underwear. As one friend put it, “We sagged because it was cool and to show our manhood. It was our way of saying, ‘Look! I’m wearing silk, these ain’t cotton.’” If you’re under the age of 15, ask your mother, grandmother or aunt, if she wore bell-bottoms, platform shoes, halter tops and mini-skirts during her teens. Chances are she did. Fashion trends come and go, and come again. MTV, BET, YouTube, and DVDs have transformed this 1970’s rite of passage into a universal statement of individuality. It has lasted and lasted and crossed generational lines. Baby boomers in their 50’s and 60’s have been sagging along with their grandchildren. Florence M. Howard is an accomplished, dynamic and compassionate visionary. She obtained her first library card at the then-recently integrated Main Library on Peabody in Memphis . Director of Community Affairs for WREG-TV, she established and ran the Knowledge Bowl quiz show and Emmy-winning Kids Count campaign for 12 years. She obtained degrees in Journalism from the University of Memphis. Today, she is an author, publicist, event coordinator, and inspirational speaker. She opened her company, Secret Shop Communicators (http://www.sscommpr.com) in 1999. BPM: Name one entity that you feel supported you outside of your family. Throughout my life, I have been supported by good people – trusted teachers, church members and friends. Apparently, they saw something in me that I couldn’t see myself. I am always amazed by the good things that people tell me about myself. Thanks Goodness, I choose to believe them and not my own fears or misgivings. I was also inspired by things that I read. Books have helped me develop my thinking, my attitudes, my hopes and my dreams. They have helped me correct self-defeating behavior and to grow in ways beyond what I knew growing up. Growth means changing for the better, personal improvement. I am not the same person that I was two years ago, five years ago and certainly not 20 years ago –emotionally, spiritually, physically or professionally. I once heard a man who was being interviewed on a talk show and applauded for his accomplishments as a scientist, inventor, writer, etc. He answered, “All that is true but I didn’t do it all at the same time.” That said to me that we don’t have to do everything at once to become the person that God has called us to be but we should be working on some aspect of the plan daily. BPM: Introduce us to your book, From Sagging to Success and the primary message. My book, “From Sagging to Success” is a message to urban youth to inspire them to be much more than what people say they are and for the people that want to help them become extraordinary. The primary message of the book is that sagging pants might indicate a sagging mindset and how we think about ourselves influences how we act. Urban youth are often viewed unfairly and stereotyped based on their appearance. They are misjudged due to cultural misconceptions. Young people need to be aware of the repercussions of sagging. 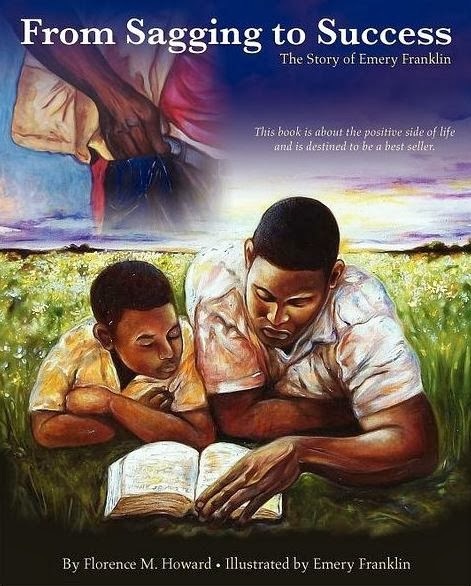 The book addresses these issues through the fictionalized account of the life of a youth named Derrick and the illustrations of Emery Franklin. The book is beautifully illustrated and the paintings were created first as a library gallery exhibit. This book will change the way you look at young people and, perhaps, inspire you to make your own dreams come true. It also gives you talking points and tools to help other people. 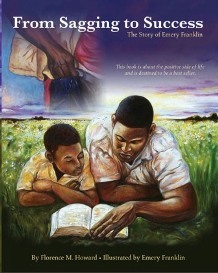 Read “From Sagging to Success” and become better informed about Black history, inspired to grow and be more successful. BPM: What drew you to tackle the questions or topics in your book? I was inspired to turn pictures from a Black History month art exhibit into words and motivate young people, about the world, about life in general and about Black life in particular. The first painting in the book is timed after the Emancipation Proclamation, the second painting looks at the Reconstruction Period, another focuses on the Memphis Sanitation Workers Strike. That strike is part of my history because my mother and stepfather participated in those marches in 1968. I ran News Channel 3’s Knowledge Bowl competition from 1987-1998 and I saw firsthand how little of our history young African American know. I have seen them drop their heads when slavery is mentioned instead of realizing that they are the descendents of survivors. From 2002- 2008, I worked with the local NAACP running the Voter Empowerment Campaign and the Get-Out-To-Vote effort. It is sad to say that our children do not know our history and what they know is not in the context of our experiences. As the author, I gave history and background information to put the paintings, their time and place or subject they illustrated into context from an African American perspective. I bring my perspective to the topics in the book – low self-esteem, the after-affects of mistreatment, voting in local, state and federal elections, changing the way your think, educating yourself, recognizing your own genius, committing yourself to being successful – all of it. BPM: What are the most important responsibilities of parent or guardian? I believe the most important responsibilities of a parent or guardian is to love, respect, nurture, correct and train a child. Whether a parent is present or away from the home, children need to know that you care and in the absence of something being said or done to indicate otherwise, children grow to believe they are forgotten and unimportant. I am an experienced writer with two degrees in journalism and whatever I write is guided by my faith. I pray over every sentence. I recently meet a fellow author at a mutual book signing that asked me unexpectedly if I believed the Bible is the word of God. I said, “Yes, without a doubt, I believe the Bible is word of God and that it was written by men who were inspired by God in what they wrote.” He laughed at me and said “how do you know?” I answered that my book was written by me and inspired by God. That ended that part of the discussion. My writing is inspired by my faith. Otherwise, it would not be as clear, as insightful or as real. BPM: How is the book being received by the readers? The book has been well-received: Readers love the book. It is a must-have for anyone with children and grandchildren and for those who teach or work with them. I am working on some workbooks for students in elementary, middle school and high school. The Book is Great!! And it will be a bestseller, needs to be standard reading for every child in Memphis and through out the United States …yes seriously. ~ Rhonda T.
I want my readers to recapture the dreams that they laid aside or never attempted and to accomplish them. I want them to go from a sagging self-concept to an empowered experience and feeling of success. I want everyone to realize that how you think is more important that how you dress. BPM: How does your book relate to your present situation, spiritual practice or other life path? Thanks to self-publication of “From Sagging to Success,” my life-long dream of being a published book author has come true. Writing the book made me examine my own actions and attitudes toward success and to refocus my understanding of what the Bible says – “As a man thinketh in his heart, so is he.” Now I challenge every negative thought and loudly and intentionally practice anticipation and thankfulness. I also think of the outcome that I want to see happen so that when God does it, He gets all the credit and the glory. Everything that I write has its own purpose. The purpose of “From Sagging to Success” is to educate about our history and successes, illuminate concepts of success and inspire readers to act on what they learn. Right now, I am finishing up my family’s genealogy book which is designed to educate older and younger family members about our personal heritage and to help locate others who through marriage, distance and circumstances don’t even know they are part of the group. Money is not the only thing that can be inherited. The inheritance can be a lifestyle as well as an attitude of success, responsibility, creativity and the ability, talents and skills to make your way in the world. My mother didn’t leave my brothers and sisters a lot of money. She taught us how to appreciate life, to be kind, hardworking and it paved the way for our successes. Her favorite mantra was: “You don’t know whose hands you will fall in.” When she died at the age of 45, we were blessed to hold each other up and to stay close because we had been trained to help each other and to rejoice over each other’s successes. “From Sagging to Success” is a message to urban youth and the adults who want to help them become extraordinary. Young people are unfairly judged because of their appearance and cultural misconceptions. They need to be made aware of the repercussions of sagging. Sagging pants even might be an indication of a sagging mindset or low self-esteem. A fictionalized character in book illustrations, Derrick goes from sagging to success as he learns about Black history, reads books read and written by successful people and changes the way he thinks. Derrick shares his new knowledge with his parents who also embrace a positive outlook, productive behaviors and principles of success. At the end of the book, Derrick and his parents have successfully transmitted principles of success to the next generation. The book is beautifully illustrated and the paintings were created first as a library gallery exhibit. Purchase the book for youth centers, libraries, and love ones! Andrea Foy is an author, speaker and coach. She conducts workshops and seminars on topics such as: Women in Management, Leadership Skills for Women, Professional Presentation Skills, Self Esteem, Assertiveness, Diversity, Leadership Skills and Business Etiquette. Ms. Foy has been certified by the Professional Woman Network as a Professional Coach and Diversity Consultant. Ms. Foy’s knowledge of business and professionalism comes from over 20 years of customer service experience working for companies such as McDonald’s, Sears, Delta and USAir Airlines, American Express Financial Advisors, Sharkey’s Modeling and Talent Agency the Federal Government. She is a member of Professional Women’s Network and the National Black MBA Association. Among her many accomplishments, Ms. Foy has authored her first book, has a Bachelor’s in Communications from Wright State University and is working on her Master’s Degree in Business and Technology specializing in Management and Leadership from Capella University. She is also an Advanced Communicator with Toastmasters International. My family, my health, my success, friends, talent and the Obama family! I am thankful for being a published author. It is one of the most challenging but rewarding things you can do in life. Being a self-published author puts you in complete control and it is nice. BPM: Tell us about your latest book, HIRE POWER: How to Find, Get, and Keep a Job. What are the main subjects discussed? My book is a non-fiction book for the mature YA reader, with tips on job hunting, customer service and working in general. BPM: Readers, I would like to introduce you to an important book, In the Still of the Night: Personal Safety for Women by Andrea Foy. * Violence against women is a universal phenomenon. * Women are subjected to different forms of violence – physical, sexual, psychological and economic – both within and outside their homes. * Rates of women experiencing physical violence at least once in their lifetime vary from several per cent to over 59 per cent depending on where they live. * How to make your home safe when you are there and when you are not. * Safety tips for traveling in a car, bus, or train. * Cruise safety tips for traveling alone or with a group. * Safety tips for young women going to college. * Tips for protecting yourself online. A former International Flight Attendant, author, professional speaker and coach, Andrea has traveled extensively. She has witnessed events and has experienced things that have stayed with her. Her experiences have taught her well and she is now on a quest to ‘pay it forward.’ This book is not filled with facts and statistics, charts and graphs but will real- life stories and observations. This book is must for all women from 12-102. BPM: How important is reading to you? Communicating in some way, talking, reading, writing, it is like breathing to me. It calms me down and soothes me, no matter what the content. BPM: Have you ever considered what kind of legacy you want to leave future generations? What do you want to be remembered for? I hope my book is used for future generations because they all need to learn. BPM: How may our readers contact you online and pick up your latest work? Readers can purchase HIRE POWER: How to Find, Get, and Keep a Job at my website: http://www.andreafoy.com and Amazon.com. It is available as an e-book too. Purchase In the Still of the Night: Personal Safety for Women Published by Professional Women Network (www.pwnbook.net), Personal Safety is available at: http://andreafoy.com/book-table, http://www.pwnbooks.com and http://www.Amazon.com. Hire Power is a how-to guide that steps you through the process of landing the job you want—yes; want—to knowing when to leave for better opportunities. Geared toward the workplace neophyte, this book provides insight for the experienced employee too. The first thing you want to do when starting a job search is DREAM! Take time to decide what you want to do. Back in my parents’ day, people worked for the same employer and to what time it regardless even if they didn’t like the job. Nowadays the average is seven jobs before retirement. Whether it’s a desire to go to college after post-high-school employment, a planned career change or loss of work due a volatile economy, employer/employee loyalty has waned. A little preparation while not employed will do wonders for your career and life. Mind mapping is a great exercise to help organize employment options. The process starts with a broad theme and then incorporates brainstorming to narrow the focus. Use a sheet of paper or poster board and colored pencils to write what you like or want. For example, if you like animals right to work ANIMALS in the center of the paper and then circle it. From the circle draw several lines so that appears to be a sun with rays. The brainstorming component considers different professions that deal with your like: animals. Write each profession-veterinarian, pet store owner, rescue shelter, as well as just, dog trainer, groomer, etc.-on a different sunray. The next phase of brainstorming looks at each profession in more detail. Consider what the job entails and what it takes to acquire the job. Let’s start with veterinarian. Draw several lines under the veterinarian sunray. Words like COLLEGE, INCOME, SICK PETS, SURGERY, EMPLOYEES, etc. will be placed on those lines. Repeat the process for each profession until you have developed a, good list of information. If you choose to study veterinary medicine for eight years, you can work as a receptionist at animal clinic to gain experience and be close to your like. Even if you’re not in dire need of a job, do not go to the first company that offers you a position. Do your research. Compare and contrast. Evaluate pay them benefits; analyze the location of travel and aspects. Consider work hours and your availability. You would do yourself a disservice by accepting the job that makes you miserable. Apply for a job at a company where you’d like to work. Do the employees seem happy? What is the business’ appearance? Does the company to promote from within? Can you envision management or even owning the business over time? Is the location easily accessible by car or mass transit? Begin with the end in mind. Think about the future beyond tomorrow. You may have to spend a lot of time away from family and friends so may not why not make the work environment almost as enjoyable as being at home. Far too many people take a job for the money and end up disappointed, frustrated and miserable. To make matters worse, they transfer that dissatisfaction to their co-workers making the workplace a difficult environment for others. Simplify your life. Be proactive and go where you want to work versus where you have to work. Applying anywhere for financial reasons only doesn’t it benefit you or your employer. Research companies in which you expect to excel. How can you best help the company? Copyright © 2009 by ANDREA FOY. Excerpted by permission of the author. All rights reserved. No part of this excerpt may be reproduced or reprinted without permission in writing from the publisher. Excerpts are provided solely for the personal use of visitors to this website. Andrea Foy is an author, speaker and coach. She conducts workshops and seminars on topics such as: Women in Management, Leadership Skills for Women, Professional Presentation Skills, Self Esteem, Assertiveness, Diversity, Leadership Skills and Business Etiquette. Ms. Foy has been certified by the Professional Woman Network as a Professional Coach and Diversity Consultant. Ms. Foy’s knowledge of business and professionalism comes from over 20 years of customer service experience working for companies such as McDonald’s, Sears, Delta and USAir Airlines, American Express Financial Advisors, Sharkey’s Modeling and Talent Agency the Federal Government. She is a member of Professional Women’s Network and the National Black MBA Association. Among her many accomplishments, Ms. Foy has authored her first book, has a Bachelor’s in Communications from Wright State University and is working on her Master’s Degree in Business and Technology specializing in Management and Leadership from Capella University. She is also an Advanced Communicator with Toastmasters International. JAN. 22 AND 23 ONLY! Thirteen-year-old Brianna Walker is ecstatic. She’s about to sneak off to meet her first real boyfriend—a boyfriend she met on Facebook. But Brianna is in for a horrifying surprise because her boyfriend doesn’t exist. Instead, Brianna unwittingly becomes the captive of a ring of drug dealers- turned-human traffickers who prey on lonely girls from dysfunctional homes. But they’ve made a big mistake in targeting Brianna because she doesn’t meet either of those criteria. FREE! 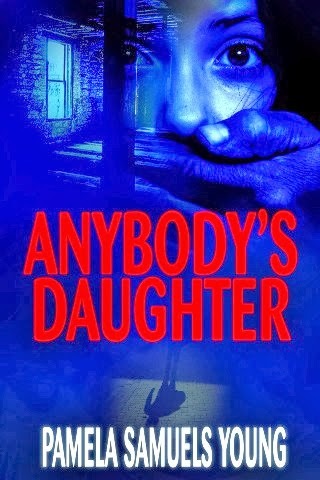 #ImageAward nominated Anybody’s Daughter free on Kindle today! Sale ends 1/23. BAN RADIO BOOKING GUESTS FOR MARCH AND APRIL! 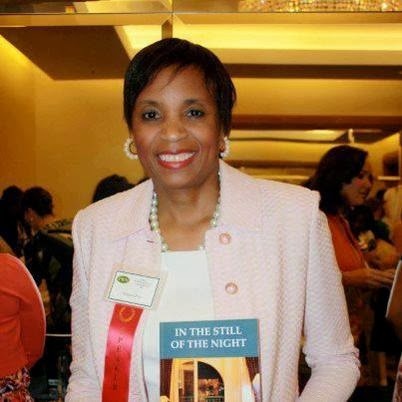 EDC Creations was founded by Ella D. Curry in 2000 as a event planning agency and transitioned into a full service literary themed PR firm in 2005. Ella D. Curry is the president of EDC Creations Media Group. She brings more than 25 years of PR and marketing experience to clients in film, music, publishing and corporate event planning. Her expertise as well as her love for all things literary, dynamic database of 165,000+ loyal readers, and collaborative approach with clients have earned her a reputation as a respected leader in the publishing industry. EDC Creations produces virtual events, social networking opportunities, and provides innovative web media, which aided in creating strategic alliances with book clubs, authors, social network partners, and business owners around the world. Take a look at our packages today, go here. 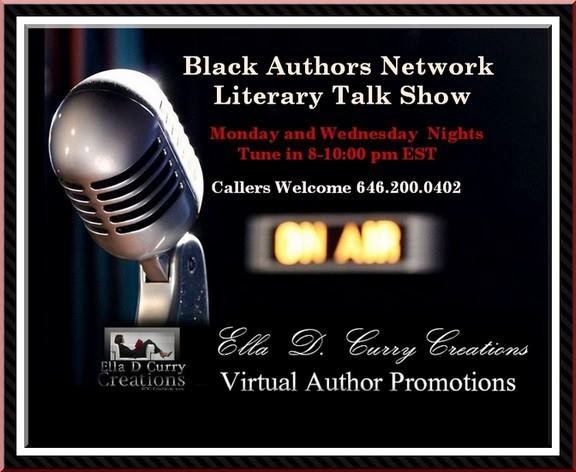 Ella D. Curry is the producer of the Black Authors Network Radio Show. Through the internationally syndicated online BAN Radio Show and Black Pearls Magazine, Ella has interviewed community leaders and celebrities such as: The View’s Emmy® award-winning co-host, Sherri Shepherd, Byron Pitts Emmy® award-winning journalist for 60 Minutes, literary legends Dr. Maya Angelou, Sonia Sanchez, Walter Mosley, Eloise Greenfield and Hill Harper. We assist authors and businesses that are too busy to tackle the cyber- world or to take care of the behind the scenes activities of the day-to-day corporate front. We are virtual publicists, marketing specialists, book coaches and brand developers. EDC Creations is determined to become one of the most powerful literary forces in the industry. Offering the self-published and independently published author the same quality of exposure as the traditionally published author. Let us make life just a little easier! 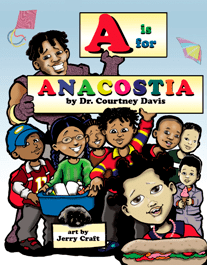 A is for Anacostia is a fun, colorful alphabet book for children of all ages. The story highlights the youth and activities in the Anacostia neighborhood, a vibrant community located in the southeastern quadrant of Washington, DC. Dr. Courtney Davis has been an avid reader since she was a young girl. As the daughter of parents who valued reading, she was surrounded with books, magazines and opportunities to create stories. She has a passion for working with students in urban areas helping them unleash their potential to become change-agents in their communities. Dr. Davis has also been a practitioner and advocate for children with disabilities and their families for more than 15 years. These experiences inspired her to create books that encourage children to read. A native of Chicago, Illinois, Dr. Davis now happily resides in Historic Anacostia. This is her first picture book. Visit her online at http://www.aisforanacostia.com.